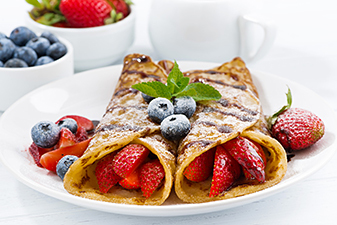 Crepes are a traditional French food and are becoming increasingly popular with fast food restaurants looking to have healthy options on their menu. Crepes are a thinner version of pancakes made from flour, milk, butter, and eggs. A variety of fillings and toppings such as bacon, ham, chocolate syrup, dried fruits, vegetables, fruits, and more are used to prepare sweet and savoury crepes. People love this iconic French food because it is versatile, and you can have it for breakfast, lunch, or dinner. 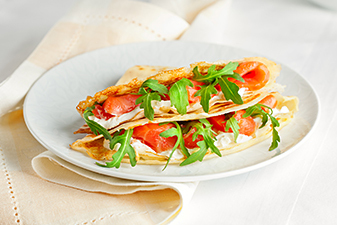 Crepes get their name from the Latin word Crispus, meaning undulated and crinkly or from the Greek word, Crispos, which means wrapped or rolled up. Using wheat flour to make crepes became quite popular in the ninth century. Buckwheat flour was used to prepare them prior to this. They are presented in a variety of ways. Some may serve them in a shape resembling half-moon. People also serve them by folding into the form of a triangle or roll them with filling inside. Another fancy way of serving crepes is to place the stuffing in the middle and tuck the edges to form a small parcel. Liquor may be used in the preparation of crepes to help break down any lumps in the batter as well as to enhance the flavours of the ingredients. During the Middle Ages, watered down wine was used instead of milk to prepare the batter. The second of February is celebrated as National Crepe Day every year. It is commonly called Jour des Crêpes. It is the day when people celebrate the Christian feast of Candelora. A common tradition is to make a wish and toss a coin in the air while flipping a crepe over in the pan carefully. In Italy, many people prefer to have crepes baked in an oven as an alternative to lasagna. In Québec, people often prepare and serve thick crepes as a traditional food in the small shacks and farms where maple-based products are produced. In some types of soups, crepes are cut into strips and added to the broth, similar to the Austrian Frittatensuppe. Blinis are a Ukrainian version of crepes usually eaten with caviar. It is believed that they symbolize the rebirth of the sun at the end of winter. The name of the Belgian crepe is Vôte, made from buckwheat flour and slices of apple or currants. People also use beer in the batter and serve warm crepes with sugar or cold with syrup. Crepe Delicious is a well-known healthy fast food restaurant and creperie specializing in creating tasty crepes. We use the finest ingredients to make and serve freshly cooked crepes to our customers. As a popular name in the healthy fast food business, we are dedicated to preparing nutritious and delicious meals for people on-the-go. If you are looking for a healthy food option, find the nearest Crepe Delicious location and visit us to try our crepes. We also serve many refreshing flavours of gelato.